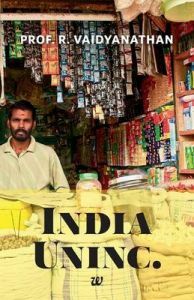 About The Book India Uninc. is a book that focuses on presenting its readers with an accurate picture of the Indian economy. This picture is far from the so-called truth and is a revelation of what many 'experts' have to say on the Indian economy. Many of the country's leading newspapers, TV channels, business magazines and internet sources have voiced their views concerning India Inc. On the contrary, the author highlights the important role played by partnership and proprietorship firms, small kirana stores, small manufacturing units, household enterprises and other such units in the economy of the country, over the years. Thanks to the research conducted over a number of years, these units are getting the respect and recognition that is rightly due to them, in this new book. According to the author, entrepreneurs of small businesses need to be able to carve a niche in today's capitalistic economy. Providing you with a treasure of information and insight that is the result of the author's hard work, this book aims to give you a deep understanding of what the Indian economy is really all about. It is also ideal for those who want to understand India itself. India Uninc. has been published by Westland, in the year 2014 and is available in paperback. Key Features The book is based on research that has been conducted by the author, over a span of several years. The book clears countless misconceptions that people have, concerning the Indian economy. About the Author: The author of India Uninc., Prof. R. Vaidyanathan is a highly experienced teacher, who has been a part of the teaching staff at IIM, Bangalore for almost thirty years. He is immensely popular among his students and is a committee-member of many regulatory bodies, such as RBI, SEBI, Pfrda and IRDA. He is also a part of the boards of many corporates. He comments regularly on matters concerning the nation's economy, in a number of popular newspapers.